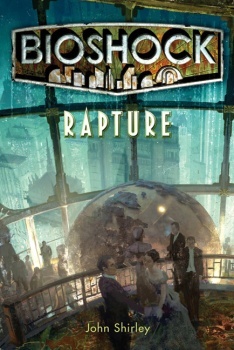 For those who just can't get enough BioShock, a brand-new prequel novel by sci-fi author John Shirley entitled BioShock: Rapture is coming next week. The underwater city of Rapture is one of the most uniquely fascinating and magical game environments ever created. It's not just a city underwater, it's an art deco masterpiece that captures the ornate beauty of an era in which all things really did seem possible. Rapture is gone now, sadly, as Irrational Games has moved on to Columbia, but for fans looking for a new fix and a bit more insight into the years before the collapse, BioShock: Rapture could be just the thing. The new novel is written by John Shirley, an American author who brings a pretty solid CV to the party. His 1998 short story collection Black Butterflies won the Horror Writers Association Bram Stoker Award, he's collaborated with influential Neuromancer author William Gibson and co-wrote the screenplay for the super-awesome 1994 film The Crow. That alone makes him okay in my book. BioShock: Rapture comes out on July 19 in both hardcover and paperback editions. A preview of the novel, in which Bill McDonagh fixes Andrew Ryan's crapper, can be read at titanbooks.com.